Department of Life Sciences organized a seminar on “CAREERS IN CLINICAL RESEARCH” on 19th February 2019 for the final year UG and all PG students. 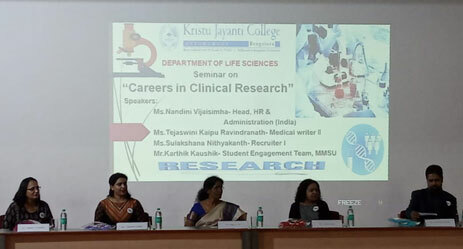 The resource persons, Ms. Nandini Vijaisinha (Head, HR and Administration), Ms.Tejaswini Kaipu Rabindranath (Medical writer II) and Ms. Sulakshana Nityakanth (Recruiter-I) who are the part of MMS HOLDING – ORGANIZATION addressed the students on Clinical research and its related opportunities in career. The headquarters of MMS Holding is situated at Canton, Michiga, USA. She also put forth to the students about CRO – Contract/Clinical Research Organization, which is a data-focused clinical research organization that supports pharmaceutical, biotech and medical device companies. Ms Tejaswini Kaipu is the medical writer-II at MMS Holding branch in Bangalore. She explained the students about drug development. She also explained about CRO and also put forth that medical writing is the art of communicating clinical, scientific and research knowledge. The seminar was a very fruitful and an enriching one. On 4th October 2018, UG final year and PG students of the Department of Life Sciences participated in the International Lecture Series on the topic, Contemporary and Ancient tissues give modern insights into Biomedical engineering. The guest speakers were Dr. Joseph Orgel-Professor of Biology and Biomedical Engineering, Illinios Institute of Technology, Chicago, and Dr. Elizabeth S. Friedman- Professor of Anthropology. Lewis College of Human Sciences, Illinios Institute of Technology, Chicago. Dr. Calistus Jude, Dean, Faculty of Sciences, welcomed the gathering. Prof. Dr. Joseph Orgel gave an insight about the collagen and extra cellular matrix (ECM) structure. He explained the collagen structure and its Triple- helical conformation. He also showed some evidences of how collagen of different organ and tissues from different animals had different X-ray diffraction.Prof. Joseph shared his experience working with Tyrannosaurus bone, relationship and similarities with the structure of collagen found in the bone of this species of dinosaur and the collagen structure in the modern animals Later Dr. Elizabeth S. Friedman took over the session on the Illinois Institute of Technology (IIT), Chicago. She shared the information about the history and architecture of the institute and also the list of programs available at IIT including the new summer programs that were introduced last year that includes IPROs and ELEVATE Program. International Guest lecture enlightened the students with new knowledge which they were not aware of and gave them an idea how the collagen works. On 22nd September, 2018, the Department of Life Sciences, organized an alumini interaction programme. Mr. Abhijith Sharma, Head of Clinical operations and Scientific Strategies, Aurigene Discovery Technology, Bangalore, was the guest of honour. The convention flagged off with the invocation of Gods precedence over the gathering. The guest speaker, Mr. Abhijith Sharma, a proud alumnus of Kristu Jayanti College (2005- 2007 M.Sc., Biotechnology) addressed the Post Graduate and Under Graduate students of Life Sciences on Drug discovery and careers in bio-pharmaceutical industry. He also shared his views about various cancer therapy treatments available and different stages of drug discovery. He also widened the talk on the analytic aspect of pharmaceutical industry and the job options for students in that frontier. Overall it was quite an informative and beneficial session for the students. It also served as a prospect and outlook for their future in the field of Science. The objective of this interaction was to give awareness in the recent techniques in the field of drug discovery and wide opportunities in bio-pharmaceutical industry for Life Sciences students. The Department of Life sciences organized a Guest Lecture on “Science and Career” on 24th August 2018 at 2.40 p.m. in Mini Audi III (UG Block) .Dr. Smita Jain, Associate Director, India Bioscience, Bangalore, addressed the students on wide career options ahead after the completion of courses. The career options were, Bio-Entrepreneurship, Teaching, Science communicator, Sales and Marketing, Grants manager, Core facility personnel, and so on. She also added on applying for internships in India Bioscience. The students interacted with her about the options of getting a job at the end of their graduation. The talk in a nutshell was truly an enriching and motivating experience for the listeners and was a real source of inspiration. Towards the end of session Dr. Smita highlighted the various courses and consultations offered by their institute related to Science and Research. Also added that Life sciences and allied sectors are gaining more importance in India than ever before, be it industry, biomedical and basic research or the understanding of our spectacular biodiversity. The students were introduced to different DNA sequencing techniques and to the portable real time device for DNA and RNA sequencing on 31 August 2017. The components and working principle of this portable sequencer was explained to the students. He further explained that, this DNA sequencer is being used for a number of biological analysis techniques including de novo sequencing, targeted sequencing, RNA sequencing, met genomics, epigenetic etc. He also mentioned that, researchers from various streams like environmental research, human genetics, clinical research, microbiology, infectious diseases, cancer research, industrial diagnostics, agriculture etc. are using this portable DNA sequencer worldwide. The advantages and efficiency (a flow cell can generate 10-20 Gb of DNA sequence data) of the instrument was also discussed. He touched upon the software called “Albacore” which is used to read the sequence. Mr. Rahman, technical expert from the same company explained the mechanism of DNA sequencing and the software used to analyze sequence data. Prof. Peter Monk on 14 September 2017, shared his research about preventing the emergence of antibiotic resistance with the students. Peter monk first explained how a bacterium develops resistance against drugs by citing simple examples and further explained the consequences of it. Peter Monk described about the receptors present on various cells in our body to which the bacteria binds. After binding to the receptors on cell surface, they grow, reproduce (forms a biofilm) and some become antibiotic resistant. There are several ways exist to prevent bacteria from gaining antibiotic resistance, one simple way is to prevent the attachment of bacteria on target cells. Dr. Lynda Patridge gave a brief introduction about antibodies and how they work against infectious organisms or cancer cell in the body on 14 September 2017. She next explained the process of generation of antibodies against certain proteins. She explained a technology that her company is working on in which certain proteins are isolated from cancer cells and antibodies are raised against those proteins. Department of Life Sciences organized a guest lecture and interactive session as part of the Research Promotion Series on 29 July, 2016. The resource person was Mr.Sarshad Ibnu Sayed, Ph.D. Scholar- University of SZEGED, Hungary. Mr.Sarshad presented his lecture on the topic “Genetically engineered Bacteriophage-mediated Dispersal of Biofilm and Quorum-Sensing-Study on Staphylococcus aurous and Bacteriophage Interaction”. The lecture was an insight on bacteria that produce biofilms and the translational capabilities in the scientific arena. He made students aware of topics related to bacteriophages inhibiting Biofilms and Methicillin resistance in bacteria. Guidelines on pursuing summer fellowships and Ph.D. programs in other countries were also given during the latter part of the lecture. The session was a knowledge filled and fulfilling experience for the PG students of the Department of Life Sciences. There was a visit of Dr. Robin Sebastian to our college who did an integrated Ph.D. and M.sc from IISc, Bangalore. His findings have revealed that exposure to endosulfan affects fertility in animals. He also did a molecular level study on DNA, to find out whether endosulfan modifies its structure. His interaction gave light into the topic. Thirty to 33 per cent of male mice treated with endosulfan showed clear signs of infertility. Its impact on mice is an underestimation as they used lower doses. People are exposed to much higher doses and for a longer duration. Ten animals per group were studied and the experiment was repeated three times. A dose equivalent of 3 mg/kg of body weight was used in the experiment. This dose is equivalent to that seen in places where people live. Compared with 20-700 microgram/liter serum concentration of endosulfan in humans, the treated mice had a serum concentration of just 40-60 microgram/liter. Besides lower serum concentration, the duration of exposure was also very short. The animals were treated with four doses of endosulfan per day on every alternative day for eight days. In all, each mouse in the treatment group was exposed to 16 doses. Detailed studies revealed that among all organs, liver, lungs and testes were maximally affected after the very first day of treatment. Kidney, liver and brain were not affected. In the testicles, many seminiferous tubules were completely devoid of mother cells that become sperms. Since it takes 30-35 days for mother cells to become sperms, at the end of 35 days after the latest treatment, the number of sperms in treated mice was far lower compared with mice that were not treated with the pesticide (control group). Besides lower sperm count, the motility of the sperms was affected. Twenty-five days after the last day of endosulfan treatment, the motility of sperms was significantly affected. However, at day 35, the pesticide’s effect on motility was not significant because spermatogenesis gets over by 30-35 days. So the effect probably wears off after that Unlike mice that were exposed to endosulfan for a limited period, people living in the areas where the pesticide is being used are continually exposed and may see the effect on motility continuing to be significant if an effect on humans is the same as seen in mice. The researchers carried out mating experiments to double check the effect of lower sperm count and less motility in mice. They allowed the pesticide-treated male mice to breed with female mice (in 1:3 ratio of male and females) that were not treated with endosulfan. The mating experiments were carried during three periods (5-10 days, 20-25 days and 30-35 days after treatment with the pesticide) about 30 per cent of males did not give any progeny. In all three mating windows, the percentage of infertile males increased as opposed to zero infertile males in control groups, indicating that the reduced sperm count and motility contributed towards reduced fertility in males,” notes the paper. Indeed significant is that the 20-25-day window showed the most infertile males. This is only to be expected as at 25 days post-treatment, the sperm count had dropped to its lowest point and the sperms had the least motility. Besides fertility, the pesticide was found to damage the DNA and increase the levels of error prone DNA repair leading to genomic instability. Reactive oxygen species were found to be the culprits causing damaging to DNA and the DNA repair mechanism. On 10 February 2015 a guest lecture was jointly organized by the Department of Life science and environmental club. Dr.Ravikumar, Scientist D, Seribiotech Research laboratory, Central Silk Board was the chief guest for the program. Dr. Ravikumar began his lecture; defining the terms PCR based detection of silkworm diseases. He later explained the various techniques used in the analytical sciences under the quantitative and qualitative categories. He gave an overview on the various techniques used in sericulture industry. He also presented the videos on the fully automated labs really fascinated the students. On 8 June, 2012 a seminar on BT crops was held at Kristu Jayanti College Bangalore. The seminar was held as a part of the Vignanamanthan- Life Science Forum of Kristu Jayanti College on the valedictory function of the Jayantian Life Science Forum. The seminar started at 10 a.m. in presence of Fr. Sebastian T.A. Principal Kristu Jayanti College and Dr. Elcey C.D. Head of the Department Life Sciences. All the faculty members and the students of Life Science Department were also present in large numbers. The speaker for the day was Dr. M.J. Vasudeva Rao, President Ag Technologies, Metahelix Life Sciences, Bangalore. The seminar began with an invocation song by the college choir followed by the welcome address by Fr. Sebastian T.A. The speaker for the day was then introduced by Dr. Deepa M.A., Faculty of the life science department, Kristu Jayanti College. The session was then handed over to the speaker Dr. M. J. Vasudeva Rao. Dr. Rao spoke about many relevant topics in the field of agricultural biotechnology. He spoke about the different genetically modified crops like BT Cotton, BT. Corn, Golden rice etc. and their significance in agriculture. He also covered the scientific aspects like the genes involved in the genetic modifications of the crops. The beneficial aspects of the BT crops, there production and their effects on the economy of India in recent years were brought to notice by the speaker. The speaker also introduced the students to the various Regulatory Authorities and Committees that are authorized by the Government of India for the approval of the BT crops and the BT seeds before they are released into the market. After his lecture, Dr. Rao was requested to give away the prizes to the students excelling in various programs of the Knowledge Development Programme of Life Science Forum conducted in the college. Thereafter, Dr. Vasudeva Rao was given a memento by Dr. Elcey C.D... The Programme was then concluded by a vote of thanks addressed by Dr. R. Kavyashree, Faculty Coordinator, Jayantian Life Science Forum. On 24 September 2012, Monday a seminar on Genetically Modified Crops was held at Kristu Jayanti College. The Programme was conducted as part of the ‘Vignanamanthan’– Jayantian Life Science Forum. The speaker for the day was Mr. Sunil Kumar, Principal Consultant, NITTA Gelatin India. He has been working as the Marketing Head in various BT companies producing GM crops and GM seeds. He was part of ‘Montax India Ltd.’, when the company first introduced the BT Cotton in India. The speaker being a marketing consultant, he spoke about the benefits of GM crops and the GM seeds. He also shared his experiences of interacting with the farmers and making them aware of the GM seeds. He then spoke about, how his team had to introduce the GM seeds to the farmers & convince them about their benefits and eco-friendliness.